Vortox Air Technology, Inc.’s S and SA style Oil Bath Air Cleaners are compact and light weight but still clean extremely well and require less space for mounting. S and SA styles of Oil Bath Air Cleaners are made with three main units: the Body Assembly, the Vortex Chamber, and the Cup. The air flowing through the Air Cleaner is first centrifugated by the Vortex Chamber to remove the heavier dust particles. The air then flows into the filter element, carrying with it oil from the oil reservoir, or the Cup. The dust remaining suspended in the air, with the oil picked up from the Cup, impinges upon the filter surfaces. The cleaned air passes on through the filter, and the dust laden oil drains back to the reservoir. 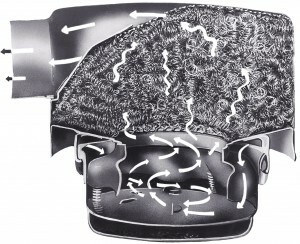 Clean oil is displaced from below the Disc and the cycle is continued. The circulation of oil is both rapid and continuous. Please note: An Oil Bath Air Cleaner will last as long as it is serviced properly. Environments producing extreme amounts of dust will need to service air cleaners more frequently. For servicing instructions, please refer to the “Service Instructions” folder located in the Literature section.